2) EVENTS WITHOUT EVENTBRITE LINK: Head to the Facebook event and select yourself as "going" on there. Feel free to ask any questions on the event discussion board. 2) EVENTS WITHOUT EVENTBRITE LINK: Click the button below to register! Unless stated otherwise, all events are for those who identify as female. If you have any questions about whether an event is kid friendly, pet friendly, etc.. please send an email to events@girlswhohike.org prior to registering! Search Bar Tip: Use the name of the chapter that you're seeking out events within! Example: If you're in the Hollywood area, you would search for Los Angeles. This Hike is led by GWH Ambassador Kristen Dugger. Trail Rating:GREEN: Mellow hike, easy to follow, elevation gain of 1,000ft. and under, low altitude. Novice hikers welcome! 2L of water required. 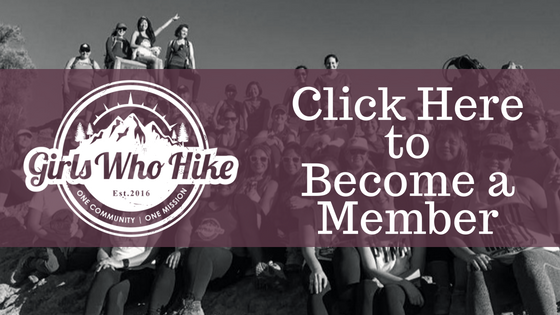 This Hike is led by GWH Ambassador Maria Gamez! Water Required: 3L of water required. Dogs: Yes but must be on a leash at ALL times. There are lots of wild animals out here and the leash rule is strictly enforced here by rangers. Permits / Passes: None Required but you may donate at the entrance. Trail Rating: GREEN: Mellow hike, easy to follow, elevation gain of 1,000ft. and under, low altitude. Novice hikers welcome! The path is a bit rocky at times but I'd still consider this an easy trail with good mileage. This hike is open to hikers of all skill levels. We’ll be hiking as a group, and nobody will be left behind or forgotten. 2L of water required. Distance: 8.1 miles. This trail doesn't have an obvious end point so when I hiked it I just stopped around 4 miles where the map says it ends on AllTrails. Water Required: 2L of water required. Join us at the Tioga-Sequoia Brewing Company Beer Garden in downtown Fresno for a Girls Who Hike Meet 'N Greet hosted by REI. There will be discounted beers and food trucks, fun giveaways, as well as a Q&A session with one of REI's expert instructors. Spots are limited, so please make sure you register with REI at the above link. This like will also be pinned in the comments section. Please RSVP here as well. Also, since this event is in October, feel free to wear your Halloween costumes! This dog friendly series is led by LA Ambassador Mia Svenson! ADULT DOGS ONLY: Puppies who have not reached full physical maturity and are under the age of 1 year old are NOT allowed. This is a safety and health concern for your puppy. Repeated physical strain before a puppy's bones have fully ossified can lead to bone malformation and is a leading cause of osteoporosis, hip dysplasia and arthritis in adult dogs. Trail Rating: GREEN: Mellow hike, easy to follow, elevation gain of 1,000ft. and under, low altitude. Novice hikers welcome! This hike is suitable for all dogs. We will be following the LNT principles for hikes on this series. You are REQUIRED to pack your dogs poop out regardless of whether or not the poop bags are biodegradable. Friendly adventure pups only please! Some arguments between our pooches may happen, but if your dog has a history of being unfriendly or attacking other dogs, please leave him or her at home. If your dog is nervous around other dogs and you're trying to socialize him or her, you're welcome to bring him along, but he or she will be required to wear a yellow bandana. This is part of the yellow ribbon project, and let's other owners know that your dog may need a little bit of extra care when being approached. Your dog needs 1.5 -1.7 oz. of water per pound of body weight over the course of a 12-hour day. Math is hard and I hate it, but in this case, it’s absolutely worth it. I use 1.5 oz. of water per pound of body weight if the weather is under 70 degrees, and 1.7 oz. of water per pound of body weight if the weather is over 70 degrees. The formula to use here is: [(weight of dog x 1.5 oz.) / 12 hours] x the hours you will be hiking. 50 lbs. x 1.5 oz. = 75 oz. So, if I’m hiking for 7 hours in cooler weather, my dog will need 43.75 oz. of water. Any updates will be posted on the event thread via the pinned post, and I’ll update the event description if anything changes! PLEASE READ - RSVPing on Facebook does not secure your spot for this event. You must RSVP via Eventbright as space is limited max of 10! Tickets for this event will go on sale June 1st at 1pm. Registration will close July 6th at 6pm. This event is hosted by Girls Who Hike Ambassador Christa Cooper. GWH Northern NV will be doing an overnight Camping Trip & hike up to Summit of White Mountain 14,246’. This is the 3rd highest Peak in CA – Just outside of Big Pine! This is one of the easiest 14ers in the CA area. For future events in Northern Nevada, I will be doing them the 3rd weekend of every month so be on the lookout for future events for 2018! White Mountain has stunning views of Owens Valley & the Eastern Sierras in a remote and beautiful area! It is a protected are with Ancient Bristlecone Pines and Fossils nearly 600 million years old. Trail Rating: Red – Strenuous hike at Altitude – Experienced hikers that have been at Altitude at or over 12k. Well-marked trail. Meeting time: Big Pine CA Sat 7/21 at 12 (noon) we will then drive to the trail head at Barcroft gate, Car Camp and Start our hike Sunday 7/22 at 5:30 am. Important Details: Higher Clearance Vehicle needed to get to the trail, about 30 miles of driving on a dirt road. Although I have seen a geo metro at the trail head in past years. We will be car camping at the trail head and getting an Alpine start to ensure we have plenty of time. We will be camping at 12,000 feet. Fires are only permitted by permit, which I will not be obtaining. Meeting Location: Big Pine CA junction & SR-168. Bristlecone Pine Information and Historic Landmark. Main St, Big Pine, CA 93513. Note: If anyone would like to carpool from Reno, I have 3 spots in my car. Please bring a lot of water we will be at altitude, sunscreen, snacks, lunch dinner and extra food. Bring warm clothing even in the summer its cold at 12,000 – 14,000 feet. Bring extra layers such as a fleece, rain jacket, down jacket & pants on this type of adventure it’s very important to be prepared. Whatever you need to be comfortable & warm to camp. There are no services in this area or for 30+ miles of this area. This is a moderate uphill hike at elevation with a steep uphill at the last ½ mile. This hike will take us to the Summit of the tallest mountain in the White Mountain Range. Please don’t hesitate to ask any questions! This will be a members only event. In order to attend an official meetup, you MUST have a signed Liability Waiver on file. Please see the Group Rules for details/link to sign. http://bit.ly/GWHLiabilityWaiver It takes 60 seconds to complete and one waiver clears you for all meetups! For official meetups we kindly ask that only ladies attend. No dogs and no kids on this hike. I'm a GHWLA Ambassador & I'll be road-tripping up to the Tahoe area on July 8. I will be bringing my two pups with me and am planning on hiking as many dog-friendly trails as I can - the Chimney Beach Trail being one of them! If you're in the area and want to do a quick Sunday afternoon hike, you're more than welcome to join! - Total Elevation Gain: 249 ft.
- GWH Trail Rating: Green! Mellow hike, easy to follow, elevation gain of 1,000 ft. and under, low altitude. Novice hikers welcome! Welcome to the "Field Trip Friday Series," where once a month we pack into cars, and drive to various destinations between 2-6 hours away. Cars Leave Los Angeles at 5:30am, You spend the day exploring with the GWH Community and arrive back home before Midnight. To Attend this trip, you need to join a car. You can join a car below. MAIN CAR LEAVING: 6AM Sharp from Address 7513 Arizona Ave Los Angeles CA 90045 (Meet in front of the church, free and easy street parking on this street, so your cars are safe. *Plan on arriving early, we are leaving promptly at 6am. - No Males, this is NOT a co-ed trip. - Food, or money for food is your responsibility. - If you are carpooling with a volunteer driver, it is not required, but be kind and offer something towards gas money. There is no cap on how many drivers we can have go this trip, however here are some things to consider and our driver guidelines. Gas & any Park entrance costs are drivers responsibility, but we do encourage those who carpool in your car to pitch in for gas. If you have a set amount your hoping to receive from each girl please let them know before they confirm to ride in your car. Driver assumes all responsibility for any tickets, car damage, etc. I highly encourage drivers to have a co-pilot in their car who can take over when the driver gets tired, this is 10 hours of driving in one day, plus hiking, driving will be draining. Here's the info, were not doing the full loop, only until the second lake. This is a full day hike. You need either bug spray or a bug net, food, water, sunblock, hiking poles highly suggested and our pace will be moderate. SUNSET: Pack into cars and return Home. 11pm (tentative) Arrive back in Los Angeles. - Bring correct clothing for both hiking and hot pools. - Eating in cars is up to driver, my car it is fine. - You can bring pillows to sleep in the car but remember you will be PACKED with 3 girl in backseat on one girls in front seat (other cars may not be this way. My car is free, but if you are with a volunteer driver, please be kind and float them some gas money! 1) Make sure you have the GWH Liability Waiver signed and on file! 2) Please review the REI Day Hiking checklist for recommendations on what to bring! If you have any questions about this, please feel free to reach out! 3) Read up on the trail (links provided above). Please RSVP if you plan on attending. I will also be creating a post within the group on Thursday night to get a final headcount so please keep your eyes out for that!! As always, if you have any questions feel free to comment in the page or DM me. I’ll release my phone number on Thursday! ♥ Can't wait to see some familiar faces as well as meet some new ones! This hike is led by GWH Ambassador Rebecca Lucas. The first 10 members to arrive will receive special Girls Who Hike giveaways! Trail Rating: This is a green hike on the GHW scale - it is 2.2 miles with an elevation gain of 250 feet. Be aware, this is a high elevation hike with steep drop offs and no railings! Kids: No (steep drop offs and no railing). Older kids and teenagers are welcome. To complete this hike, I highly recommend bringing snacks, water, and your 10 essentials. Since we’ll be at a high altitude, please make sure you bring aspirin or another headache soother, electrolytes, extra water, and I recommend bringing something to help you with nausea – you never know! This hike is open to hikers of all skill levels. We’ll be hiking as a group, and nobody will be left behind or forgotten. Any updates will be posted on the event thread via the pinned post, and I'll update the event description if anything changes! Hello, ladies! Our March meet-up will be at Wind Wolves. I know, I know... we've done this before. But this is usually when the park is at its greenest and prettiest, so here's hoping for a third year in a row! Moderate hike, well-signed, elevation gain of between 1,000-2,000ft., low altitude. Novice hikers welcome! Due to this area's popularity, this will likely be a FREE but ticketed event. This means everyone will need to register for ONE TICKET PER HIKER. You can reserve multiple tickets to bring a friend or two, it will cap at 3 tickets/girls though. Leave the fellas and kiddos at home for this meetup. Carpooling is strongly encouraged due to the location. There will be giveaways from our sponsors before the hike! If you do not think you're ready for this hike, it is a month out which gives you plenty of time to WORK UP to this! You are always welcome to visit Wind Wolves separately from GWH and try one of their many, shorter hikes. Feel free to reach out to the main group page if you have any questions... Our members know the trails the best and can always give you advice on whether or not to reserve tickets for this one. Novice hikers are welcome as long as you research the trail beforehand. Please plan accordingly. Please give yourself the WHOLE morning and most of the afternoon for this hike. We will be a large group and large groups move a little slower than normal. Take advantage of the extended time on the mountain to network with other members and get to know them... you never know who may become your next trail buddy! Even though this event is scheduled to end at 1pm, depending on how fast we move.. the ending time may be a little earlier or later on in the day. 2) Please review the REI Day Hiking checklist for recommendations on what to bring. 3) EVERY GIRL IS REQUIRED TO HAVE A PAPER TRAIL MAP OR ELECTRONIC VERSION DOWNLOADED! EVERY GIRL IS ALSO REQUIRED TO BE CARRYING AT LEAST 2L OF WATER. Hello, ladies! There will be a March meet-up at Hensley Lake. There is a day use fee of $5, but they also accept the America the Beautiful Pass (national parks pass). I've never done this hike, so all information is coming from AllTrails, the US Army Corps website, and Best Easy Day Hikes Fresno (book). Bring plenty of water. This hike is in early March, but it could still be warm, with little shade on the trail. Meeting Location: Trail Head Parking Lot at 9am to beat the heat. Trail head parking lot is located approximately 0.1 miles past the entrance, on the right. This Girls Who Hike Official Meet-Up will be ladies only - please leave the fellas and little kiddos at home. Teenagers are welcome. The trail is dog friendly, but all dogs must be on a leash. Note: This is a special #OptOutside Black Friday co-ed event.